Today’s blog entry is by Amanda Berg, a mental health Peer Support Worker and Coordinator of Peer Led Workshops with Vancouver Mental Health and Addictions Services. One of her recovery tools is journaling. She talks about her approach and about the inspiration she has taken from her great grandmother’s journal. The photo accompanying this article is a photo of that journal. My great grandmother Ida Nelson was a journal writer. 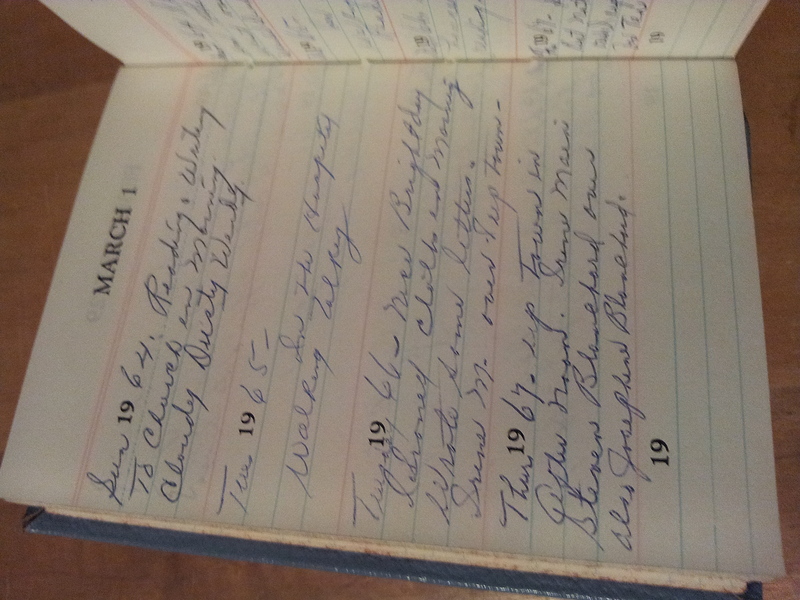 She was born in 1881 and the first diary I have of hers is from 1917. It was written in a leather book that is from the Greenbush Bank of Minnesota. She outlines her everyday life. The weather, washing, ironing, who came to visit. The writing is simple, boring, and mundane. Most days she washed laundry, baked bread and cooked dinner. One day she broke her ankle, went to the hospital and had to learn to walk again. She wrote almost every day, a few lines about the weather, what she did and how she felt in little notebooks. I opened up a blue leather five year diary with a little lock, and turned the pages and realized she died after June 23, 1967. There were no more entries. And this got me thinking about starting a journal for 2013. Recording my thoughts on paper has been a powerful tool of recovery for me. A diary is a friend who is always ready to listen. My great grandmother’s journals varied from 5 cent notepads to leather bound notebooks with locks turned by tiny keys. She wrote with a fountain pen and ink bottle and speckles of ink dot some of the pages. My latest journal was made in China. It is green vinyl fake leather with a matching elastic band to keep it shut. It’s about the size of my cellphone and I take them both pretty much everywhere. I have a big beautiful journal at home I received as a birthday gift but it is too heavy to lug around so I save it for big ideas and short stories. In the past I wrote on loose leaf paper and stuck the pages in a binder with tab dividers labeled with the month January to December and other dividers marked 1 to 31. At the end of the month I would take every page out and put them in an envelope. I used this system for a while but found it annoying if I dropped the binder. Frustration ensued if the binder claws opened up and my paper flew out. I pick up my pen and draw an oval shape in the middle of the page. After pondering a few minutes I think of a word to put in the circle. I brainstorm and draw lines out of the circle like branches of a tree. I fill up the page with words. This is my brainstorming process. The pen doesn’t leave the page. If I am stuck I scribble and do calligraphy of a letter until I think of another word. I can’t do this on a computer. I write fast. It is a five minute race for me. Music, doodling and making scribbles helps get ideas flowing and provides inspiration. Music helps set the pace so I listen to movie soundtracks. Right now, Battleship Gallactica is a favourite. Sometimes, just the sound of a pencil –the graphite sliding on paper is enough to give me an idea. Messiness isn’t a concern. Ink flows out of my pen on the page and covers my hand so I prefer pencil. It is safer and I don’t have to scrub my black fingers after. I imagine my great grandmother must have washed her hands often after she wrote with Indian ink. It would keep me on track and give me motivation to write if I had to write every day to see what my grandma was up to. So I have decided to write in the baby blue leather journal with the broken clasp. I imagine my Great grandmother Ida would be happy seeing my words beneath hers starting the day after she died. Knowing that the Crisis Fund can provide not only a drop of much-needed practical support during hard times but also a splash of a more intangible type of emotional support makes my job even more rewarding. The CIF Crisis Fund is a peer-led bursary program that assists mental health consumers who are in dire financial need due to an unexpected expense or loss. Eligible individuals must be referred by a health care worker* and may receive a grant of up to $75. As funding is limited, a person can receive a maximum of one grant every 12 months. The Crisis Fund is meant to help out when no other funding sources are available. For a variety of complex reasons, mental health consumers often live in chronic poverty or experience extended periods of significant financial strain. In these situations, any unexpected cost or loss can make one unable to afford basic necessities and cause a great deal of stress; this can put both one’s physical and mental health at risk. The Crisis Fund aims to offer some support during these especially difficult times. Some may think of $75 as a drop in the bucket, but sometimes a drop can be enough to make a difference. Having the opportunity to be involved with such a worthwhile program has played a significant role in my own recovery journey. Not only has it allowed me to work again, but I’ve been able to do a job in which (I believe) both my lived experience as a peer and my background in public health and preventive medicine add a valuable dimension. Living on a limited income has given me a firsthand understanding of the impact of additional financial stress when one is not able to afford it. I’ve been in the position of needing financial help and I know it’s not a position anyone wants or chooses to be in. More details about the Crisis Fund, including eligibility criteria and referral process, can be found on the CIF website at www.spotlightonmentalhealth.com. If you would like more information or would like to make a referral, I can be reached at 604-736-2033 (ext. 2239); all referrals are done over the phone. * For the Crisis Fund, ‘health care worker’ is defined as anyone who provides mental health-related services to referred applicants in a professional capacity.